(Typical Norwegian greeting. Not as pervasive as ‘Yah’ pronounced in two syllables with the second higher, which punctuates every conversation.) The plan for my husband and myself was to fly from Boston to Oslo, then take the train to Geilo (pronounced “yay-low”), where we would meet the rest of a group we found out about through Above the Clouds on the Web. Just before we left home my sister showed us an article from “Travel and Leisure”magazine titled “Bad Trip”. The author had gone all over Norway looking for “the land of the midnight sun” and didn’t find it. In fact, he didn’t find anything worthwhile at all about what he saw. He should have come with us. Norway is rugged and very beautiful. We were there from August 1-12. The weather was surprisingly very nice the whole time, so that we hiked in tee shirts and the only day we needed any of the GoreTex and fleece clothes we brought was when we went up on the glacier. The country is about the size of California with less than the population of Massachusetts, and we spent most of the time in the more remote parts. 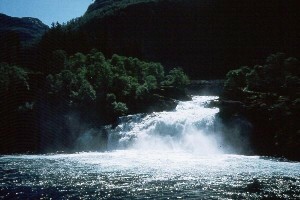 The primary sounds were of the abundant and powerful waterfalls and streams (all of Norway’s electricity is generated by waterpower) and the crunch of our boots on rock. We went about 11 or 12 miles each day that we hiked – and each day we had very different terrain and experiences. Our guide was Torger Møller-Foss, of Hallingdal Mountaineering, a Norwegian who can trace his family back 500 years and who earns his living as a farmer, a timber man, a game warden, and a mountaineering guide. He was organized, charming and funny. 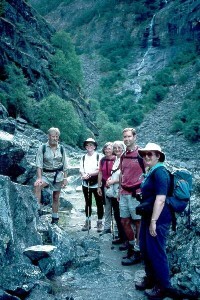 He also offers other hiking excursions and telemark style cross country skiing adventures in Norway. Our group also included Michael: a 33 year old guy from Long Island, NY, and three British women: Glynis, who is originally from Wales, Lynne and Lynn. So, altogether we were four women and three men. We all got along well and had fun. The night we arrived we had dinner together at the hotel, the first part of what would become a daily ritual. Each day dinner would be followed by Torger’s briefing of the next day’s hike as we had our coffee and dessert. After breakfast in the morning we each made our lunches. Since hiking and cycling are such a big thing in the areas where we stayed (I have never seen so many backpacks in my life! ), the hotels provide lunch foods at breakfast as part of the deal and “grease-proofs” (paper) to wrap it in. Also, hot water for tea, if you bring a thermos. Torger had us each make two or three small lunches each day, depending on the number of stops he planned. 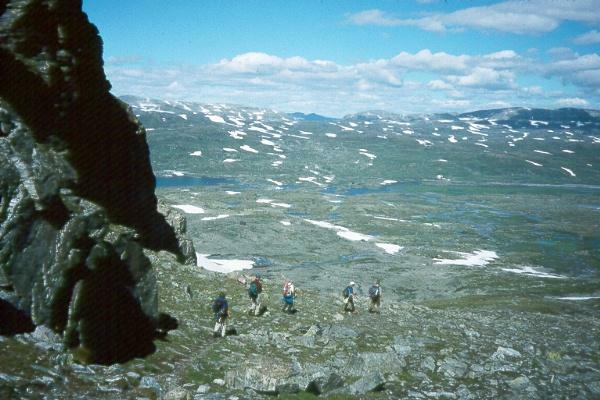 The first hiking day we headed for Finse, accessible by train, bike or on foot. No cars unless you have a special permit. To get there we hiked 11 milesof lichen covered rocky areas with gushing streams and lakes of greenish glacier water. Although the weather was warm and sunny and we hiked in tee shirts, there were patches of snow in the low places. The landscape was stark and gorgeous. We crossed a swaying cable bridge suspended over turbulent snowmelt to a spot for lunch. The hike terminated at Finse 1222, our hotel (which is 1,222 meters – 4,009 feet – above sea level), that overlooks a rockbound lake and on the other side, the foot of the glacier we would experience the next day. 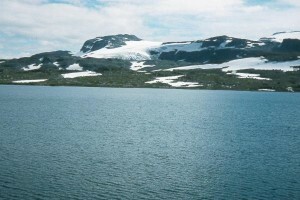 The town of Finse consists of a train station and a small cluster of buildings surrounded by pristine rocky slopes extending to the horizon in all directions and the glacier. 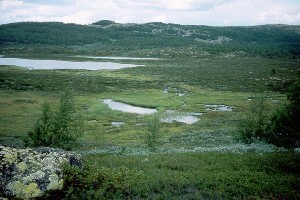 The Hardangerjokulen is 3,000 years old. Each winter 30 feet of new snow falls on the glacier and Finse. Amundsen, Nansen and other explorers came here to test their arctic gear. After dinner and our briefing I sat at one of the hotel windows overlooking the glacier. The days are very long in August there and even at 10:30 p.m. there was enough light to see and draw the glacier by. By twilight it seemed all the more mysterious and impressive. The next morning we spent 2 hours hiking past the lake across the rock approaching the glacier. When we stopped at the base we changed into dry shirts (sweaty clothes are to be avoided up there), had lunch and then put on crampons and harnesses. We wore the harnesses on our upper bodies. There was another group nearby putting on helmets and wearing their harnesses pelvic-style. They would be rappelling down into crevasses. Not us, though. This was our first experience with a glacier. Torger roped us together, about twenty feet apart. We were to proceed in a single line not letting the rope touch ground, since should anyone fall into a crevasse the less slack there was the faster we could brace to stop their fall. We went up with Torger in the lead probing with his ice ax for crevasses hidden under the snow. 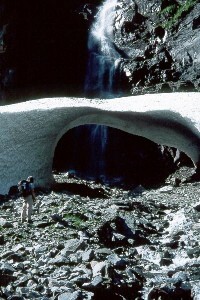 Since the weather had been unusually warm there was running water in places, pouring down into potholes three or four feet across and which fell the entire depth of the glacier. These were holes to look, but not fall, into. 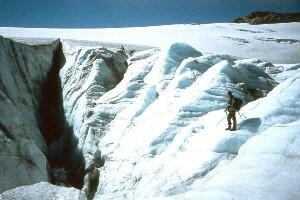 The other primary hazard is of course the crevasses, some of which are very obvious, whereas others are camouflaged by snow. The ice of the crevasses really is blue as is written. 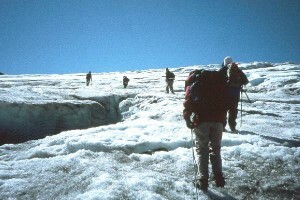 The surface of the glacier was irregular and grainy or slushy in some places, hard in others. Crampons were certainly needed. As we trudged, small dark spots littered the ice here and there – tiny clumps of decomposing fur and bone that used to be lemmings. A few years back the remains of a German soldier who died on the glacier during WWII was extruded out the side by the compression of the ice. On the way down we passed a monument to others who died up there. At one point when we were stationary while Torger probed for solid footing I saw far in the distance an opening near the base of a rocky promontory. There appeared to be three people standing still, spaced evenly apart. In spite of my sunglasses they were so far off that I couldn’t be sure and when fifteen or twenty minutes later they still seemed to be standing in exactly the same spot, I decided the verticals I saw must have been posts or something, not people.Later, through binoculars, I saw that they were indeed people, roped together as we were, standing still because they were braced to hold whoever was on the end of the rope that extended down into the crevasse. These were perhaps members of the other group we had seen earlier. We crossed the arm of the glacier nearest Finse, then had one of our lunches. Ahead our way down was over rock and snow, so we removed the crampons. It took another hour and a half or two hours to come down. We encountered a snowfield that looked very much like a ski slope at Sunday River. Some of us ran down, some bum-sledded. When we stopped to rest we were entertained by a mother ptarmigan and her six chicks. That partly made up for Torger’s disappointment that we hadn’t seen reindeer up on the glacier. Apparently because the other group had gone up just before us, the reindeer had moved off. For those who go further in there supposedly may occasionally be polar bears. The next day we took the train to Myrdal and hiked down the Flåm valley, which was spectacular. It is hard to believe that cyclists survive the steep switchbacks we walked on, but they do. The way begins high up and winds down into a lush valley sprinkled liberally with gushing threads of water cascadingdown from the snowfields at the top and making rainbows in the sun. There were birches, aspens and evergreens and beautiful fireweed and harebell-like flowers. All of the falling water converged at the bottom into a powerfully rushing river that churned the entire length of the valley on its way to the fjord at Flåm, our destination. There is one small farm – the only visible structure other than one footbridge – and that is where we stopped for lunch. Torger left us and went on ahead to take care of some things and we proceeded on our own. The path at times was nearly invisible among the flowers and grasses, but the river was our rambunctious guide. We passed an avalanche site where a stream had cut a huge arch in the snow. The water is certainly the dominant aspect of each landscape we traversed. This valley was spectacular. During the trip we often joked about the different expressions we and the Brits had. Once, when Glynis wanted to say how amazed she was by something or other she used the term “gobsmacked”. Who could let that one slide? Well, I have to say I was positively gobsmacked by the Flåm valley. Miles and miles of beauty made for a long and satisfying day. Some of us were picked up a few miles from the end, but Egils, Michael and I didn’t want it to end, so we stuck it out for the full 20 kilometers (12.4 miles) including quite a drop in altitude, since we ended at sea level in Flåm (a tiny village at the tip of Aurlandsfjord, which empties into Sognefjord). After a good meal and a solid night’s sleep Torger showed us the way to a Viking farm high on the hillside overlooking the fjord. He told us stories of the Viking family who had once lived there. His Norwegian perspective added a great deal to what was already a great trip. What an asset to have a local guide, especially someone as good as Torger. 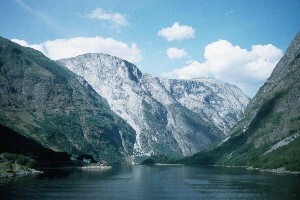 We then descended and boarded the ferry to see the two arms of the fjord near where we stayed. The two arms join in a Y formation to become Sognefjord which is more than 200 kms long – the longest in the world. The mountains lining the entire waterway on both sides plunge from great heights, sometimes nearly 6,000 feet, directly down into the deep, still water. It is pretty incredible. 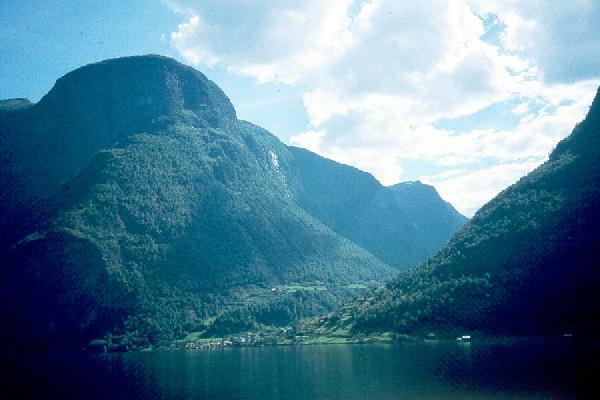 The next day we hiked the Aurland Valley – uphill all day. After an hour or so of rugged terrain, during which time we didn’t see another soul, we came to the “Good Wives’ Avalanche”. It seems that the few farms up further in the valley had used this same path to get down to the road. When the children accompanied by one of the mothers would come downhill to this point, which they incredibly did in the dark, at this point the sun would be high enough that there was light for the children to proceed the remaining hour on their own. A half hour or so further up along the trail we came to a small log farmhouse that had been built under the protective overhang of an enormous boulder. Rockslides and avalanches are commonplace hazards in this valley. Torger also pointed out the tiny summer farmhouse of this same family, a speck high on the precarious hillside. When once the farmer while walking his horse up to that site had left too much slack in the reins, he tripped on the reins and fell to his death far below. It was very hot and we saw lots of women hiking in bras – too hot for tee shirts. Torger had said we would stop for lunch at a little farm that is now used by a hiking association. Up until this point on our trip I would stay up front most of the time to listen to Torger’s stories and Glynis’ retorts, while Egils often was at the end to take pictures and so on. I had gone back to see how he was doing just before we got to our lunch spot, then I went on up with our group. As we were eating, someone said, “Where’s Egils?” I had just seen him as we approached the farm, but he hadn’t arrived. Torger had justtold us the story of the man who fell off the cliff. I ran back down to where I had seen him last. Torger sent Michael in the other direction. Egils had gone right on past us! After that I stayed at the tail end of the group where I could keep an eye on him. 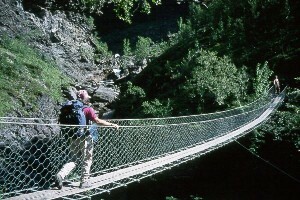 Later we had to cross the trickiest suspension bridge of the trip, but all of us got across. Because of the rushing water below some people get scared in the middle and have to be helped, but not us. Our trail ended on a road where the bus passed. Timing is important when hiking in these parts. We then took the bus to a ski resort where we had individual cabins and the main building had a heated indoor pool. The next morning it looked as though it might rain and we could see that Torger was worried about his hay. We had a quick conference and decided to experience Norwegian farm chores first hand. We all went to his farm. We saw two distinguishing features there. 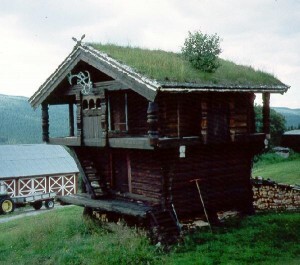 The first was the traditional Hallingdal style log building he had. Thelower floor is narrower, with the upper story having an overhang, and bearing carved columns. The roof members are topped by a layer of birch bark, then a layer of sod which grows into grasses and flowers and even sapling trees (the trees have to be removed). This living roof provides insulation from summer heat and winter cold. The other feature is the way the hay is put out to dry. Saplings are cut into lengths with one end sharpened, and are driven into the ground at perhaps thirty foot intervals. Strands of wire are strung the full length of the “fence”, perhaps three of them, one above the other. Then the hay is draped over this. So, we took down the hay and raked and pitchforked it onto his tractor, getting it all into his barn in about 2 hours (we had blisters as trophies). He gave us a tour of his beautiful house, we had lunch, then hiked for the rest of the afternoon through woods where there are elk, cattle and moose and then over miles of open country of a particular character. It looked like my idea of what a moor must be (“Wuthering Heights”, “Hound of the Baskervilles”, etc.) so I took the opportunity to ask Lynne. She informed me that it was heath. She said that moor is mostly grassland, while heath has also scrub brush. Later, part of the group went on ahead. It was a wonderful experience to come over a ridge and see, so far off in the distance, tiny specks that you squint to recognize as part of your group. In New England there aren’t too many places other than at the ocean where there is such an unobstructed view. We then were picked up by van and went back to the hotel. The next morning Egils, Michael and I took the train to Oslo. On the train we met Daniel, a thirteen year old who lives near Oslo. Daniel, like many Norwegian kids, speaks English well and invests in the stock market. He has been to Los Angeles, Las Vegas, Miami, Chicago, and six times to Spain. No flies on Daniel. He was very clever and entertaining and gave us tips about where to go in Oslo. He kept telling us to go to the Aker Brigge, but it wasn’t on our map and I couldn’t figure out what he was saying. Eventually we found it – it’s a region like Quincy Market in Boston or Harbor Place in Baltimore. Michael tried to hire him on as a guide, but no, Daniel’s mother would be picking him up at the station. Now we were on our own. We stored our bags in lockers at the station and took a ferry to the Viking Museum where there are three 1,000 year old ships on display, and back, and had dinner at a Scottish restaurant that had the word “Broadway” in front. There are 10 McDonald’s in Oslo, and some Burger Kings, pizza places, T.G.I.Friday’s, a NY bagels place and even an Internet cafe. Michael left the next morning and Sunday and Monday Egils and I went to the contemporary art museum, the Norwegian folk museum, the Vigeland sculpture park, and the Munch Museum. We saw bungee jumpers, an Australian doing a street performance with sticks of fire, and of course Andean street musicians. This time they were sort of jazzed up, unlike the more traditional ones we saw in San Francisco, Barcelona, and here in Boston. One surprise was that everywhere we went in Norway most people spoke English. If any of you decide to go some time language will not be a problem. One difficulty, though, is that everything is quite expensive there, more than here or Spain for example. It was a great trip. I feel lucky to have been there and I can see that going with an organized hiking group is a great way to experience a new country. Norwegians are gentle, hardworking people. They admire the good things about the USA. Everywhere we saw Walt Disney books for kids, American products, teenagers with baseball caps on backwards and wearing jeans, and other signs of American influence, but the Norwegians also see us as a violent, potentially dangerous society and are very careful about not exposing Norwegians to the violent American movies. Norwegian streets are safe and they want to keep them that way. In Oslo we saw very few police. It was twilight about 10:30 or 11:00 and the streets never seemed dangerous. Outsiders may change that, but to us it was a very wonderful place to visit. Egils planned this trip as a graduation present for me and I couldn’t be happier with it. I would certainly go back and explore more of Norway if I had the opportunity. Joyce is a sculptor, author, illustrator, teacher, wife, mother, and grandmother.